Joe's Foodie Spot: Night of the Choctopus! 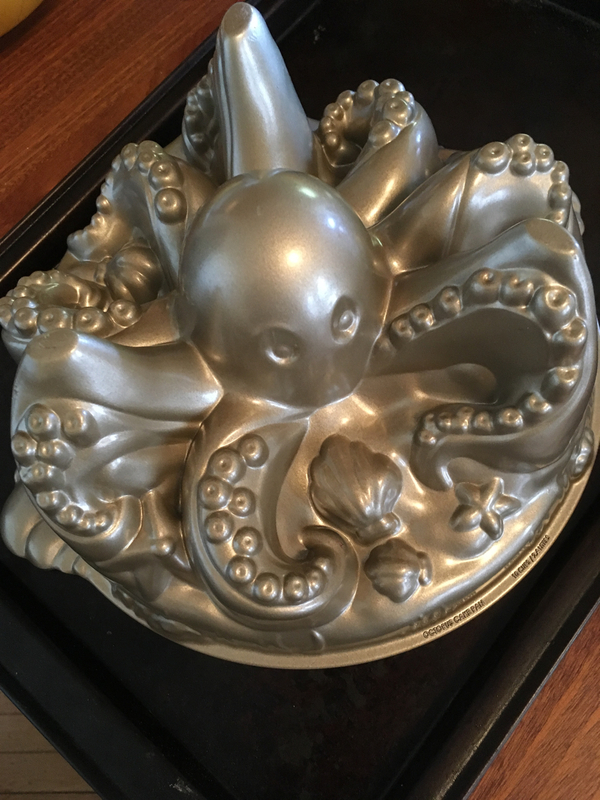 A long, long time ago, my younger sister, aware of my love of cephalopods, gifted me with a cake pan molded in the shape of an octopus. It's a super-complicated, bundt-style pan from Williams Sonoma, and perhaps unsurprisingly they discontinued it a long time ago. But I have one. So although I've had this amazing pan for ages, I've never been brave (or foolish) enough to try it out. I was going to meet friends for dinner and a game, and I volunteered to bring dessert. 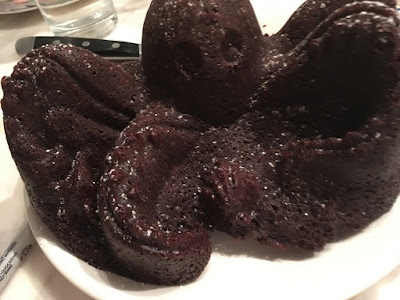 And I looked at the pan, and thought about it, and decided, "I'm not going to make an octopus. But I will make a choctopus!" 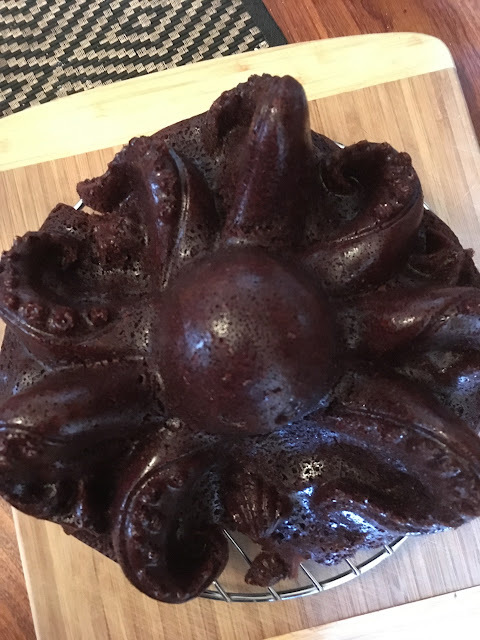 After looking around at assorted advice on chocolate bundt cakes, and rejecting recipes that began "take a box of devil's food mix and add a box of brownie mix to it...," I set my sights on King Arthur Flour's chocolate bundt recipe, which seemed surprisingly simple. I was a little concerned about having enough batter to fill the octo-pan, but comparing quantities of flour and such, I decided it should work fine. 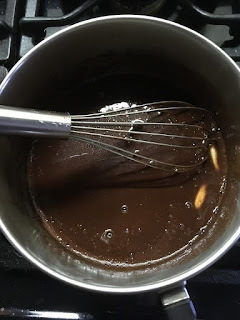 I don't have step-by-step photos of the process here, but one thing that attracted me to the King Arthur recipe is that you melt the butter (with chocolate and cocoa and coffee) before adding it to a bunch of dry ingredients. Although it's ostensibly nonstick anyway, I really, really, sprayed the inside of the pan well. 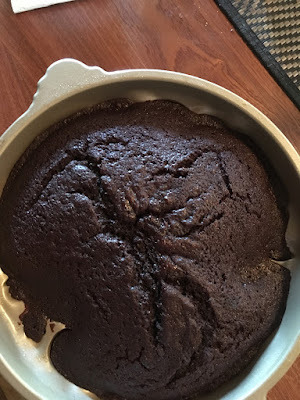 Another good trick was to put it on a sheet pan, to catch any spillovers while baking, but also to make it much easier to move it into, and especially out of, the oven. I had a brief panicky moment when i realized I don't have any skewers around the house. Would a toothpick suffice for the classic cake done-ness test? Would it probe deeply enough into the dark heart of the choctopus? These are the things I worry about when I bake. Promising, I thought. But would it come out in one piece? Would i have to do choctopus surgery? Would I have to hope it could, as some cephalopods can, regenerate a severed arm? Indeed, no. 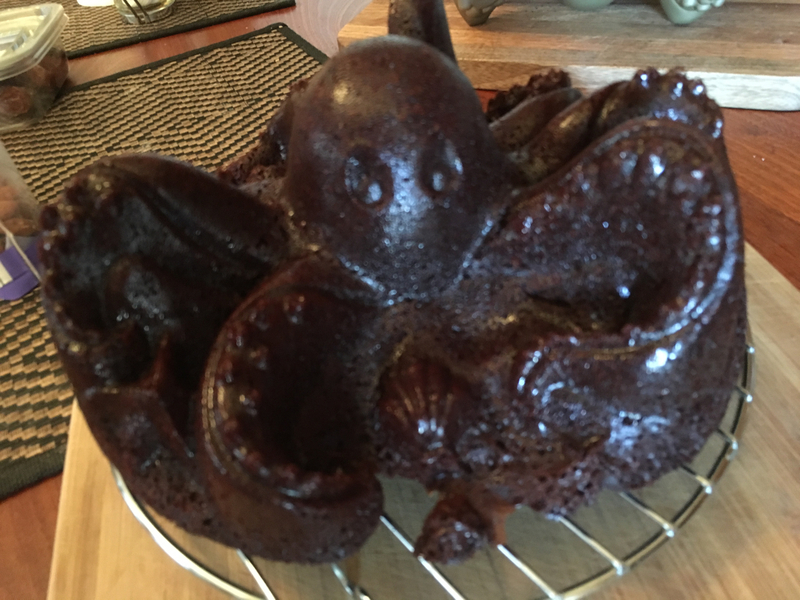 BEHOLD THE CHOCTOPUS! Fresh out of the pan, it was a little shiny, probably due to the care I took oiling it. Fortunately, I'd made the thing a day in advance. I knew I didn't want to cover up any of the details with icing, but shortly before setting out to dinner, I tried dusting it with powdered sugar. I wasn't super happy with that result. If I had all the time and patience in the world, I would've made little masks for the details, the shells and starfish and the eyes of the choctopus, and dusted to highlight those. As it was, like a light coating of snow, I think even the small amount of sugar I put on just obscured the details of what is a very detailed cake. Just serve it naked with some vanilla ice cream and call it a day, is my recommendation. 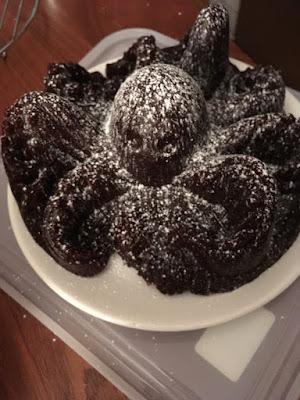 By the time we ate it, though, the powder had settled into the cake somewhat, and it was pretty much exactly what one would want in a chocolate octopus bundt cake. Finally, the insides. It was a most excellent chocolate cake indeed. I can't think of what would make it better. It had a very fine crumb, it was rich and dense but not heavy, it was moist, it was intensely chocolatey. 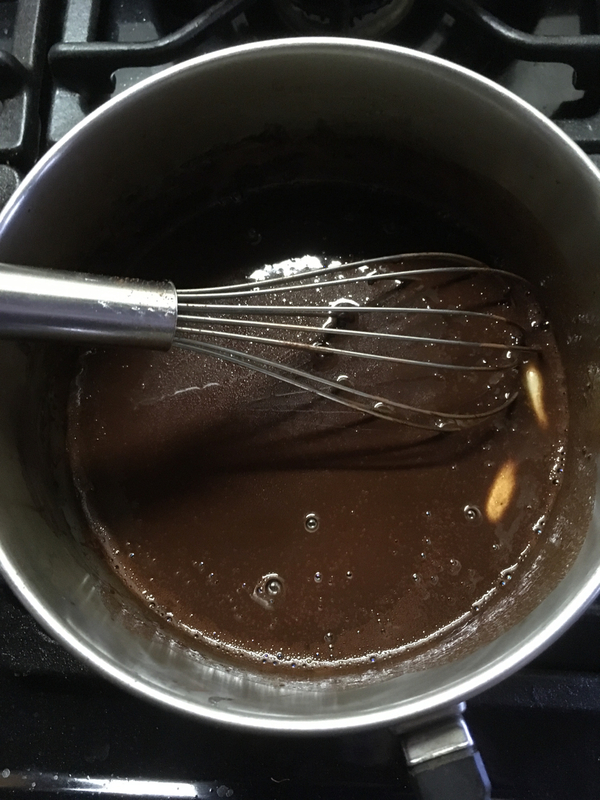 King Arthur Flour wanted a cup of coffee in the mix, I used instant espresso instead, but either way, it really works to give a grown-up complexity to the chocolate. My friends were all impressed and happy with the choctopus, too. I look forward to more cakes, and more reasons to bake cakes, in my near future. 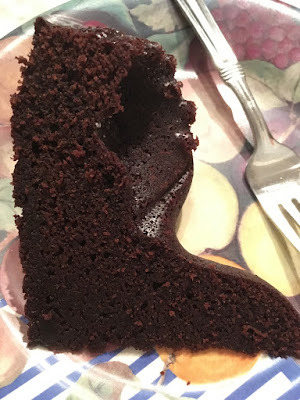 And finally, I'll just reiterate, for anyone seeking a great chocolate bundt cake recipe, I highly recommend the King Arthur Flour one.